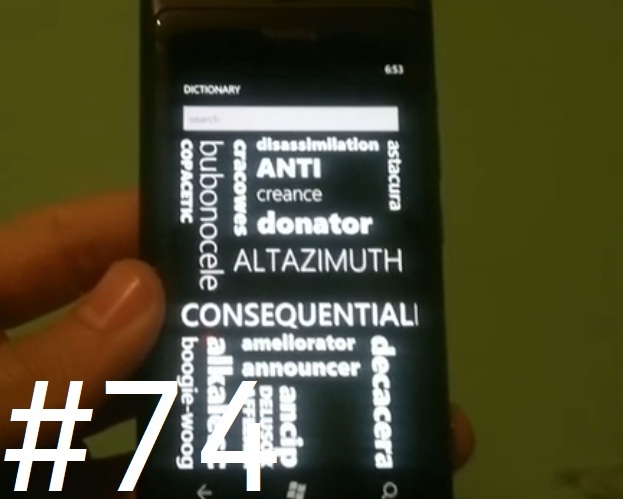 Dictionary is must have application for any Lumia phone, considering that Windows phones don’t come with a stock dictionary app as we’ve grown used to on Symbian; but worry not ‘Dictionary’ is more than an ample replacement, seeing as it comes with a great intuitive UI that’s fun and easy to use, as well as the free price-tag. The homescreen of the app displays a ‘word bubble’ that display random words from the dictionary with the ability to click on any of the words to go directly to their definition making it useful if you feel like learning a random word or discovering something new; the app also contains a large set of Medical terms whether they’re Anatomical, pharmaceutical or physiological. Dictionary is an interactive English Dictionary containing over 100,000 words and definitions. The definitions are stored locally for maximum responsiveness, without the need for a data connection. The home page contains a randomly selected word cloud which will pique your curiosity, while the search box allows you to find specific words easily. As you type, Dictionary homes in on the word you are looking for. Then you can follow the links in the definition page to get more word definitions. Wildcard letters can be used to help with word games where only some of the letters are known. Words in the definition page are linked to their own definition. Improved wildcard matching includes period (.) for single character and comma (,) for zero or more characters and limited regular expression matching. Improved formatting of definition page. Cleaner user interface when typing in search term. Word cloud shows words more quickly. New format and animation settles after a brief period. Email definitions. « Nokia Social Updated to v1.5? – more widgets.